When it comes to the best yoga socks and gloves there is no doubt that there are a lot of products you can choose from and use during your yoga sessions. However, there is no doubt that not all the items available on the market are actually worth purchasing. The best yoga socks and the best yoga gloves are certainly out there, you just need to know where to look for them and what features you should look into. More than that, you should also keep an eye out for the various brands that manufacture said products. In fact, if you pick the right brand, you might actually considerably increase your chances of getting an amazing product. This is basically what you will learn if you keep on reading: the types of products you can choose from, the available brands on the market and the most popular and high quality products. Of course, you can also do some research on your own. Any yoga sock review and any yoga glove review should give you valuable information that you can use when making a purchase. Depending on what customers find more comfortable, manufacturers have come up with several types of yoga socks and yoga gloves. In my opinion, picking a certain type of product is somewhat of a personal thing in that you end up picking the product that is most fit to meet your needs. Reading yoga socks reviews or gloves reviews will certainly give you an idea of what type of product you find best! These are my personal favorites when it comes to yoga socks. I find that they are ideal for beginners and experienced yogis as well. This type of yoga socks look a lot like regular socks, except that they are fitted with a rubber-like surface that ensures the perfect grip. If you have kids then you know exactly how these socks look like, because there are certain toddler socks especially made so that they don’t slip during those first steps. The rubber dots on the soles do exactly that: prevent you from slipping, regardless of how complicated or straining the pose you are attempting might be. On top of that, one other major advantage is the fact that (at least when it comes to high quality yoga socks) they are made out of a remarkable fabric that allows your skin to breathe. In other words, you do not have to worry about excessive sweating, fungus or other similar issues. 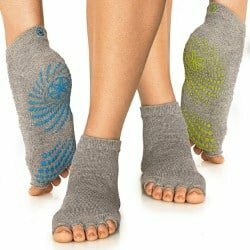 If you feel like the anti skid yoga socks might not be the right choice for you then the second option is the open toe yoga socks. We all know just how important spreading your toes is in yoga. This is exactly why this type of yoga socks exist, so that you have utter control of how your entire body is working together. Just like the previous type of yoga socks, these ones also have a no – slip surface on the sole of the feet. This surface is made out of the same rubbery fabric and has the same no – slip purpose. The main difference between these two types of socks is the fact that this one allows you to wiggle your toes and have your feet less constrained. Besides, there are plenty of people who consider that toe socks are not as comfortable, given the fact that the fabric in between their toes is not something they are used to. In this case, the open toe yoga socks are a great alternative. Although yoga is far from being a violent form of physical exercise, accidents often happen. They are most likely to occur when people strain too hard and don’t know when to stop. However, there are some cases where injuries happen as a result of improper equipment or accessories. If you know you have issues with your joints (anything from arthritis to poor lubricated joints) then you definitely need a pair of joint protection yoga gloves. These are especially made to hold your wrist in place and reduce some of the strain that you put on it during several poses. 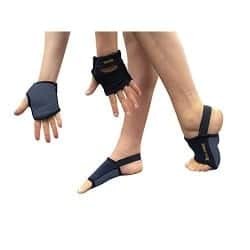 I actually find this type of yoga gloves so amazing that I dare to recommend them even to people who do not have any issues with their joints. However, given the support that they offer and the injuries that they are able to avoid, I found that they are completely worth it! Out of all the other types of yoga gloves, these are the ones that I like the best. Of course, there is a reason behind that. The thing is that when doing physical exercises, my palms tend to sweat enough that it becomes an issue. Wearing full finger gloves will certainly worsen the situation, not make it any better. So if you are looking for a type of yoga gloves that allows your skin to breathe and get aired out then these are ideal for you. You can rest assured that, just like it is the case with the yoga socks, these gloves also have a non-slip surface. This ensures an ideal grip and it guarantees that you will be able to perform even the most demanding yoga poses without having any trouble. You should keep in mind that all these gloves have adjustable straps so that you get the perfect fit and they do not slip off your hands. As you have probably already figured out, there are plenty of brands available on the market at the moment. There is no doubt that some are better than others. This is exactly why I have deemed it necessary to make a list of who not only what to wear to yoga class. This manufacturer does not only make some of the highest quality yoga clothing items, but accessories as well. They have the best Gaiam yoga towel and a lot of other items that might make your yoga sessions a lot more comfortable. For instance, reading a Gaiam restore foot massage roller review will be more than enough to prove just how amazing this brand is. In any case, what you need to know is the fact that they have a very strong tradition and experience in the field and have become one of the most popular brands. They constantly seem to be making their customers happy and excited about new and innovative products. If you pick a Gaiam product you are almost guaranteed to end up with an exceptional item that was made with the highest quality standards in mind. You should also check out their yoga equipment, mats and any other related products. Although Sanuk is not exclusively focussed on manufacturing clothing and accessories for yoga, they are still responsible for making some of the best yoga gloves and socks. The fact that they are a very popular and well-received brand by customers says a lot about the quality of their products. Any Sanuk shoe review that you will find online praises the company for all the amazing features of their products. The same thing goes for any Sanuk yoga sling 2 review or other mentions of the items that they produce. All in all, this seems to be a trustworthy brand that has gained the sympathy and loyalty of customers all over the world. More than this, when it comes to yoga pants vs leggings, you will find some quite interesting alternatives among their products, alternatives that are meant to give you all the comfort and flexibility that you need during your yoga sessions. As opposed to Sanuk, this company is exclusively focused on yoga and yoga accessories. This means that there is a lot of research that went into manufacturing certain products, namely the yoga socks and gloves. In my opinion, these guys are clearly professionals as they know exactly what features the gloves and socks should have in order to meet the needs of the most demanding customers. There are plenty of yoga paws reviews and even yoga toes reviews that come from people who have actually bought and used these products and the great news is that the positive aspects of their items are always overwhelmingly superior to the negative ones. This is a more than compelling argument for the Yoga Paws brand and it makes it even more obvious that they are determined to make amazing products. Other than that, you should know that the brand has many other yoga related products available on the market. You should definitely check them out and see exactly how amazing these items are. When it comes to the best yoga socks and gloves there is no doubt that there are plenty of available options for you to choose from. In order to make things easier, here is a list of the best ten products and everything about their main features. Any Gaiam yoga glove review only has positive things to say about this product. And considering all the amazing features that it has, it actually is no wonder that there are so many clients who regard it as one of the best products available on the market. These yoga gloves are made out of 92% cotton, 6% nylon and 2% elastane. Given the fact that the gloves have such an effective no – slip surface, you can actually use them even without a yoga mat or any other accessories. This is great news for yogis who aim on spending as little as possible on their yoga gear. Other things that you might want to keep in mind regarding this product is the fact that the gloves are fingerless. In my opinion, this is the best type of yoga gloves, because it gives you the necessary flexibility and it prevents your palms from sweating. Just like with the Gaiam yoga gloves, any Gaiam yoga sock review that you get a chance to read online will only praise this product and for good reason. In case you did not yet know this, Gaiam is one of the best brands when it comes to yoga accessories and clothing. This means that they are only making high quality items that the customers are more than thrilled to buy. On top of that, this company is constantly making changes and improving products so that they perfectly fit the needs of customers all over the world. These yoga socks allow you to practice yoga even without a yoga mat and they are also made with a non – slip surface so that you get the ideal grip for the various poses you want to try. However, as opposed to the gloves, the socks are not toeless but offer a full covering of the feet. You should certainly give this product a try, because it is definitely worth it! One of the most amazing things about this product is the fact that, just as the name suggests, the fabric the gloves and socks are made out of is skin thin. In other words, this ensures that you get the best out of your regular yoga routine and you are able to take advantage of a very comfortable experience. What I like the most about this product is the fact that both the socks and gloves do not offer full coverage of the hands and feet, but simply a non – slip surface in the most essential spots. Both the gloves and socks are highly comfortable and can be adjusted to size. However, you should keep in mind that this is a set and if you want to buy only yoga socks or yoga gloves, you might want to look for the products separately. If, on the other hand, you are looking for a set then this might actually be the right choice for you. If the first yoga socks from Gaiam on our list were closed toe, this product offers an alternative for people who prefer to be able to wiggle their toes during their yoga sessions. The amazing thing about this item is the fact that it abides by the same high quality standards that the company has used its customers with. The socks come in many different colors so that they can fit the rest of your yoga outfit. They have a no slip surface and, most importantly, they have a one size fits most level of adaptability. This is actually ideal if you are usually having a hard time finding socks or yoga socks that fit and don’t slip off your feet or are too tight. The socks are machine washable in cold water and they are ideal for traveling. In fact, while traveling you don’t even need to bother to carry your yoga mat with you, because you can take the socks and start your yoga session wherever you are. This might not be such a popular brand, but I have discovered that, at least this product, deserves a spot on the list. The socks have an amazing non slip surface on the sole of the feet. Needless to say, this will ensure that you don’t slip and are able to perform each and every yoga pose in the most correct way possible. More than this, the socks have a half toe, or open toe design. This allows you to perfectly stretch your toes as they naturally tend to do during most poses and maintain your balance much easier. The socks are made out of breathable cotton, spandex and elastan. What you should keep in mind is the fact that apart from yoga, the socks are also ideal for pilates, aerobics and many other types of physical activities. This means that you are into more than just yoga, you can certainly use these socks for your various physical endeavours. Here are some features that you need to take into account when buying yoga socks and yoga gloves. As you have already noticed, yoga socks and yoga gloves tend to have a non slip surface that is meant to allow you to perform all the poses you need to perform in the best way possible, without slipping or without being hesitant because of the fear that you might, at some point, slip. This means that ach and every type of yoga socks and yoga gloves that you look into should have that no slip surface. What you need to know here is that manufacturers have come up with various solutions to create that surface that allows you to have the perfect grip. There are some yoga sock and glove models that have some rubber dots on the soles of the feet and on the palms. These rubber dots provide you with a steady and non slip surface that allows you to perform at the highest levels. However, in time, these dots might get blunt or simply break off and you end up having a regular sock. The other option is of a full rubber like surface on the palms and the soles of the feet. Although you might think that it is more desirable, this option also has its disadvantages. First of all, it does not allow your palms and feet to breathe as much and second of all, it tends to crack in time. Either way, you need to weigh your options and decide which of the two versions is the best one for you. In any case, when it comes to buying yoga socks and gloves you should always make sure that they have the non slip surface! Yoga gloves and socks offer you two options: full cover or half covered toes or fingers. The choice is entirely up to you and I personally consider it to be a question of comfort and preferences. One the one hand, the fingerless gloves and half toe socks allow you to have a more natural yoga routine, as the fingers and toes stretch in a more comfortable way and help you keep your balance more easily. On the other hand, products that offer a full covering of the fingers and toes tend to give you a better grip, given the larger surface. The bottom line is that when it comes to yoga accessories and especially yoga clothing, there is an obvious battle between what is comfortable and what is effective. It is up to you to discover all those products that are worth purchasing and think you could successfully use. In any case, in order to avoid any unpleasant situation when you buy something that you don’t know how to use or doesn’t feel just as comfortable as it should, you need to do your research first. Read all the online reviews that you can find, check out the available brands and see what their customers say about them. Once you have your homework done, you should be able to make the right decision when it comes to purchasing the next pair of yoga socks or gloves.